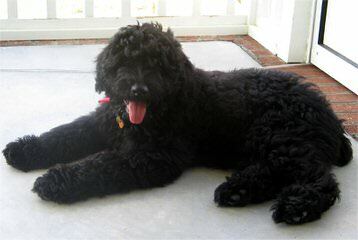 All of the puppies on the JLdoodle’s farm are bred for health, beauty and most of all, a calm, loving, gentle disposition. We prepare each puppy to be a service, therapy dog or loving family member. A tremendous amount of time and love is dedicated to socializing, and holding each baby everyday calmly on their backs in our arms, actually a average of 30 hours is spent with each puppy from the time they are born to the time they go to their new home . The whole family shares in the joy of raising your puppy. All of our dogs spend time with us on the farm, in the house daily. They have plenty of socialization skills even at at very young age. And lots of time to exercise and run.